Below are answers to the most frequently asked questions we have received. They are organized by category/subject. Geography - Are Spiders in my neighborhood? Spider Identification - I saw/caugt a spider, what is it? Email of bites from a Brown Recluse - Fact or Myth? Have a question about spiders? Let SpiderExpert answer it! Read Stories about Spider Bites and share your own. Where do Hobo and Recluse Spiders live? Hobo Spiders live in the Northern United States as well as Canada. They can be found anywhere in Washington, Oregon, Idaho, Montana, Wyoming, Utah, Colorado,and Southern British Columbia. We feel that it is likely that there are Hobos in Northern California. We have also received spider samples from the many parts of Mid-West and North Eastern USA which appear to be Hobo spiders. 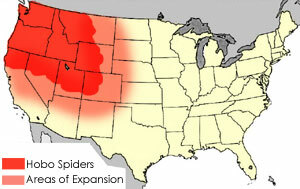 The Red areas of the maps show regions with Hobo Spiders. 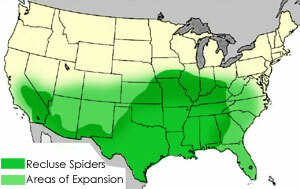 Recluse Spiders live in the southern United States from California to Florida and up to Nebraska & Missouri and over to Virginia. I saw/caught a Spider. How can I identify it? First, visit the Identification Page to find a match. If you can't find your spider, send an email to info@hobospider.net and ask how to proceed. Let them know if you have digital pictures, live samples, or other resources. What do Hobo and Brown Recluse Spiders look like? Hobo Spiders are brown and measure roughly 12 to 18 mm in length. Their legs show no distinct rings and have short hairs. Their abdomens have several chevron shaped markings. Males are distinctively different from females in that they have two large palps that look like boxing gloves. These palps are often mistaken for fangs or venom sacs, but they are in fact the male genitalia. The females also have these palps, but the ends are not 'swollen' as they are on the males. Females tend to have a larger abdomen when compared to males. The most recognized feature of the Brown Recluse spider is violin pattern on the cephalothorax or, in other words, the location on the top side of the spider near the head. Thus they have been nicknamed the Fiddleback Spider. 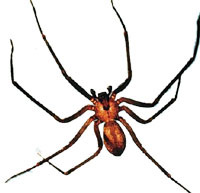 This characteristic is common in adult brown recluses, but some young brown recluse spiders do not have any contrasting pigmentation in the violin region. Recluse spiders also have abdomens devoid of any coloration pattern. Their legs lack thickened spines but are covered with fine hairs. Unlike most U.S. spiders, the Brown Recluse spider has six eyes arranged in pairs called dyads. (Most U.S. spiders have eight eyes arranged in two rows of four.) One dyad is anterior, or toward the front, and the other two are lateral, or toward the sides of the cephalothorax (where the first legs of the spider attach to the body). All 13 species of U.S. recluses have this same eye pattern. To the left is a picture of a Hobo Spider bite. Brown Recluse bites are the same. About 50% of bites are 'dry,' meaning that no venom is injected, and nothing happens to the victim. Often times the victim does not even realize that he has been bit. What will happen after I'm bit? This ulceration 'scabs' over within three weeks from the initial bite, leaving a permanent scar. If the bite is delivered in fatty tissue, the lesion may be very deep and extensive and not heal for two or three years. Systematic reactions to Hobo Spider poisoning include severe headaches, nausea, vomiting, soreness, and flu-like symptoms. What should I do if I get bit? Consult a physician. In extreme cases where the bite was not taken care of early, skin graft, amputation, and the possibility of bone marrow failure may occur. What are natural preditors of Hobo and Brown Recluse Spiders? There are 3 major predator spider types that if found in homes seem to reduce the amount of Hobo spiders: the Steatoda spiders, Large jumping spiders, and the other harmless European House spiders. Pets such as cats will feed on Hobo and Brown Recluse spiders after playing with them. The preying mantis will also eat Hobo spiders but due to its day time activity and the Hobo spiders night time activity optimum results are not achieved. Other competitors or predators would include birds, cats, "cat face" spiders, wolf spiders, some crab spiders, several wasps, and other web weavers that may catch a hobo in its web and then feast. The reason for some of the effectiveness of these other insects is not because they are incredible hunters. Instead, it is because of competitive exclusion or in other words, there just isn't enough room or food for the hobo spider so it won't try to make a home. How can I control Hobo and Brown Recluse Spiders? The foremost expert on Hobo Spiders, stated that ". . . traps are far and away the most safe and effective measure that can be used for controlling hobo spiders indoors." And, in fact, traps have shown to be the most effective means available to control Hobo & Brown Recluse Spider populations. In order to kill Hobo or Brown recluse spiders with pesticides you usually have to hit the spider directly with large doses. The problem with non discriminate spraying is that you kill the good competitor and predator spiders and insects and thus make more room for the more mobile and hardy Hobo & Brown recluse spiders. This will often lead to a worse problem as one man witnessed in 1997 in his own home. Email Photos of Spider Bites - Are they Real? 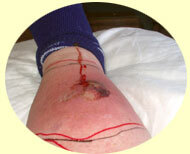 It is possible that the wound did result from a recluse bite. However, a number of aspects of this story are pretty suspicious, and have the classic symptoms of a hoax. No one can seem to verify where the alleged bite occurred, whether a spider was caught in the act of biting or at the scene of the crime, whether the victim was tested for additional etiologic agents of necrosis such as bacterial infection, if a doctor actually made the diagnosis or it was a self-diagnosis from the victim, if the diagnosis came from an area of the country that actually has brown recluses, etc. Some versions of this have included a picture of a spider that was supposed THE spider that caused the wound. Not so. It is a stock photo from an Ohio university website. This image was used last year in a very hyperbolic news story in Long Island. The final summary on this is that if it indeed is a brown recluse bite, then it is truly one of the rare, horrific ones however, there is not sufficient information provided with this image to ascertain whether it is credible or not. Read what Dr. Kenneth Burton has to say. ©2003 Big H Products, Inc.